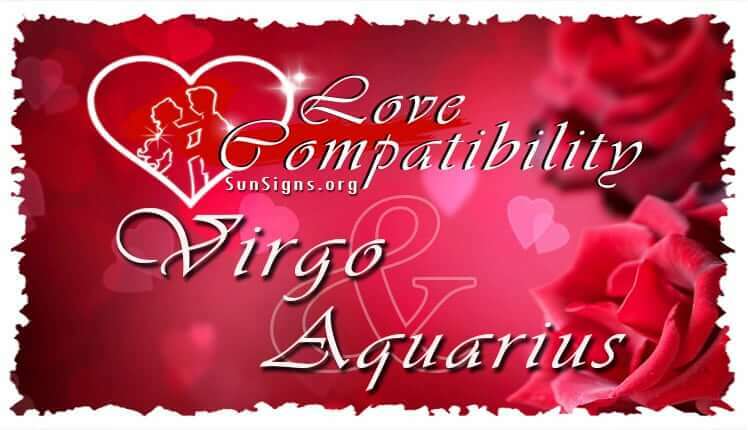 A romantic love compatibility between a Virgo and an Aquarius can turn out to be wonderful or it can be dreadful. t all depends on how they play off of each other’s similarities and differences as well as each other’s strengths and weaknesses. These zodiac signs will need to put some effort into this relationship to make it work. The whole outcome of the Virgo Aquarius compatibility depends simply on how well these star signs can get along with each other on a daily basis. Will their similarities be strong enough to outweigh their differences? Keep reading to find out just how compatible a Virgo-Aquarius relationship really is. The Virgo sun sign is a strong-willed sign who isn’t afraid to advance in the world. This sign is usually a hard-worker that pays close attention to detail. This sun sign is rather realistic and knows that a person needs to work hard to get what they want. Once this sign decides on a goal they go for it; this sign is extremely ambitious and determined to get what they want. Although the Virgo man or Virgo woman is serious about their work-life, they also crave to have a peaceful home-life. This sign wishes to guide their family with traditional values. Virgo personality will want to be in a steady relationship with someone who they can trust and depend on. They will do whatever they can to help their partner, even if they are not the best at helping out themselves with their own emotions. This can annoy some star signs, but it’s all a part of Virgo’s nature. Can an Aquarius personality get along well with a sign with traits like these? Aquarius is an independent and creative sign. They need to have the freedom to do what they please, when they want to do it or else he or she will not be able to be entirely happy with their life. This astrological sign is anything but stable. The Aquarius man or Aquarius woman is always moving from one adventure to the next, and when they are not they are planning their next big move. To say the least, an average desk job will bore them. The Aquarian is not a sign likely to be able to easily hold down a full-time job. Aquarius men or Aquarius women don’t leave their job because they don’t know any better; this sign is highly intelligent. They just value their own happiness over financial stability. This horoscope sign loves to learn new things. So even though they are much different from the Virgo man or Virgo woman, they may want to stick around to learn more about that sign. This sign may act detached emotionally like Virgo does, but Aquarius cares deeply about their friends and family. As it is clear to see, these signs have many differences that could make this Virgo Aquarius friendship hard to work out. However, both of these signs love to learn new things. Who knows? Perhaps these signs can learn something from each other. Let’s look at some of the pros of the Virgo and Aquarius love compatibility. These two signs are likely to meet somewhere where something important is happening. Virgo is not a social being, so they are not likely to go out unless it is for a good cause. A charity banquet or another type of fundraiser would be a likely place for these signs to meet. While it will most likely be the Aquarius that first makes a move on Virgo, it will be Virgo that starts the first real conversation. While Virgo is not very social, they still love to educate others. While they do not go on many adventures of their own, they will be thrilled to listen to Aquarius’ stories of excitement and possibly danger. Int the Virgo Aquarius relationship, the virgin will love adding their input to theses stories, like revelings facts about the area where Aquarius was or something similar. The Aquarius male or Aquarius female is a social being, and they will love all of the attention that the Virgin is giving them. It is likely that, if nothing else, these two signs will be great at holding conversations with each other. If these two signs get around to the Virgo dating the Aquarius it will usually be Virgo who plans out a date and Aquarius that would rather try to be spontaneous. It is not just their dates that look like this. Virgo loves to plan out things to the last detail so that they know that they are doing everything right. Aquarius, on the other hand, would rather go somewhere without a plan or even a final destination in mind. This opposite trait can bring out both the best and the worst in this Virgo Aquarius compatibility. It all depends on how they work with it. In the Virgo-Aquarius marriage they can either decide to learn from their differences and add to their own personalities, or they can fight about their differences to try to prove that one way is better than the other. Overall, this is a relationship that is full of opposites. These two signs can either chose to go with the flow and love each other for who they are. Or they can get upset at trivial differences and ruin the Virgo and Aquarius love compatibility because of it. The relationship status of these two signs ultimately depends on their individual attitude towards their differences. Now that we’ve looked at the pros we can tell that there are some good parts to a Virgo-Aquarius romantic compatibility. However, it is obvious that there are some big differences between the way that these two signs think and act. These differences can be what make or break up the Virgo Aquarius relationship. Let’s look at some of the things that have a higher chance of messing up this relationship. Here are some cons of a Virgo and Aquarius compatibility. The Virgo and Aquarius in love think very differently from each other. When doing something Virgo will want to be as organized as possible so that they stay on track for their goal. Aquarius, on the other hand, starts going after one goal and then quickly switches to another one. It is likely that the Water Bearers will start more goals than Virgo but finish less. Just watching Aquarius making these sorts of choices will make the Virgin upset. They will not understand why they decided to be with someone as unstable as the Aquarius partner. Aquarius and Virgo soul mates keep this same pattern for many things in their lives. And while Aquarius may not notice that this is a problem, Virgo will be deeply annoyed by it. They are not very good as displaying their emotions, even if they might want to. If they are annoyed with Aquarius for something he or she might not even mention it, but instead give them the cold shoulder. It is reasonable when Aquarius is hurt by this. They will feel helpless, as they will want to help Virgo sort out whatever is wrong, but they won’t actually know why their partner is upset. In turn, Virgo will be upset that Aquarius is not helping, and this can upset the Virgo Aquarius love compatibility, at least for the time being. If Virgo does not learn how to communicate their emotions better then it is likely that their relationship will not work out well no matter what other sign they are with. Although the Virgo male or Virgo female has problems with showing their emotions, they have no problem with hurting other people’s. They do not do this intentionally to hurt people. This sign is just not afraid to tell people what they really think, which can seem cold and hurtful at times. Aquarius will like that Virgo is so honest, but it may come at the price of a hurt ego for him or her if Virgo finds a flaw with them. These two astrological signs do have one thing in common though, and that is that they are nearly always busy. It is hard for this Virgo Aquarius in bed to find time to spend with each other or sexually satisfy each other. This can lead to this couple drifting apart if they do not put enough effort into their relationship. In conclusion, the Virgo and Aquarius love compatibility is a relationship that can go either way. There is a fair chance that if these two signs put in enough effort, and if they really care about each other, then their relationship could work out. However, if these two let their differences get between them and if they do not spend enough time together, then their zodiac compatibility could easily fall apart. This is a relationship that will take some work from both members of the couple. The individual people of these signs and how they feel about each other’s differences is really what will make or break this Virgo Aquarius couple.